Things are looking differently in DC. Gentrification is spreading but on the sports side; well-needed upgrades are popping up. Nationals Park was the true upgrade that most fans enjoyed. The Washington Mystics and the NBA G League’s “GoGo” will be moving into a new arena later this year. It will serve as the practice arena for the Wizards as well. But a team that’s been waiting for a new stadium for a while is the DC United. In 1996, the MLS started play and in 1994, DC was chosen to have a team. Times were different in that era of sports. Many teams shared stadiums with teams in that city. For example, Pittsburgh used to have the Pirates, Steelers, and even the University of Pittsburgh’s Football team shared the same stadium. That era was known as the “cookie cutter” era. Cities like Philly, Pittsburgh, Atlanta, Oakland, San Francisco, Seattle, New York, Washington, and a few others had setups like this. But as stadium technology and fan interest changed; so did the cities. Oakland is the only city that still has this type of setup but Washington’s stadium is still standing as well. What’s weird about Washington is that they did not really have teams that shared a stadium until the mid 00’s. The Nationals were established and DC United was forced to share a stadium. The Nationals moved and DC United was stuck in RFK. But that era is over. 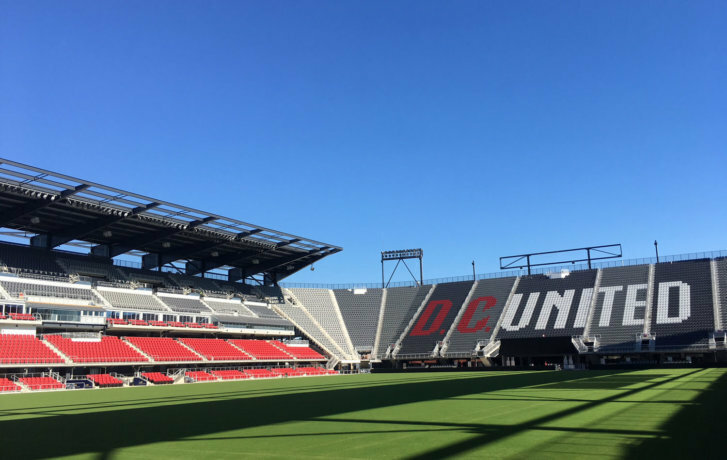 The DC United is slated to open their new stadium this weekend. Let’s just say that it’s well deserved for many reasons. For the United and the MLS, RFK was an embarrassment as other teams started to get new stadiums. It will help the MLS invest in the soccer market and you could even see college powerhouses like Georgetown and UMD use the stadium as well. For DC, it clears the ground for something else, I’ll mention that later. Overall, it’s perfect timing. Soccer is trending right now and the MLS is adding new stadiums and teams like wildfire. For a long-term fan, it’s good to see the team get an actual home to play in. I expect more interest in the team after this. Although he’s a Trump supporter and just a terrible owner, Daniel Snyder has the ball in his court. RFK stadium is basically done with. Events DC funds and run the stadium and they are planning to build things around it. But in all honesty, it needs to be demolished and cleared. Cleared for what seems obvious but is tricky at the same time. The World Cup and Olympics will be in the USA within the next 10 years. The face of DC is changing and oh yeah; the Washington Redskins needs a new stadium. They built their stadium right before fans wanted more out of stadiums across the country. Back then, they wanted seats and parking. Now, they want everything. Having events and concerts at Fed-Ex field is good but an eyesore. Opportunity to have NCAA Games and Bowl Games on the Site. The more possible non-sporting events a stadium can hold creates a better profit and created exposure for a venue. The one thing DC is lacking is that. The Captial One Arena is good at that but it only holds around 20,000 seats for those type of events. Imagine having that times three in a new stadium. But as I mentioned before, it’s up to the Redskins. They will be the biggest tenant for a stadium in the area, Although Virginia and the greater Oxon Hill area has been rumored for the stadium. DC should be the home, it’s the best option.